A few weeks ago, on an unseasonably warm day, I was wandering through Seward, Alaska with my mother-in-law while our husbands were busy fly-fishing. With a little less than 3,000 residents, Seward is a tiny coastal town with a population smaller than my high school in Anchorage. So, it was a bit surprising to run into President Barack Obama at the local gelato shop. Yes, that President Barack Obama. 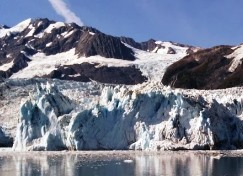 He flew in to speak at nearby Exit Glacier on the effects of global warming, which were perfectly illustrated by the warm, dry summer that was rapidly melting many of Alaska’s glaciers, and then his caravan made an unscheduled stop in town. President Obama’s comments about climate change generated a lot of attention—much more than when, say, a scientist publishes yet another report outlining the serious consequences we’re hurtling towards. That’s not surprising, since the world has always paid attention to some spokespeople more than others. The anti-vaccine movement has celebrity endorsers (and most recently, a couple of presidential candidates) that have influenced thousands of families to delay or forgo vaccinating their children, despite the best efforts of health care providers to explain that vaccines save lives. Similarly, by 1954, the deadly connection between smoking and lung cancer was known and widely spoken about, but it wasn’t until President Kennedy’s Surgeon General decided years later to tackle the issue, that any significant change occurred. Francis Darwin, son of Charles Darwin, once said, “The credit goes to the man who convinces the world, not to whom the idea first occurs.” Many of the issues we’re working on in Colorado today are not new. Improving health equity, lowering health care costs, and increasing access to care would all positively affect population health, but none of those issues have grabbed our collective attention in a way that’s led to decisive action. Getting all Americans insured was far from a new idea when the Affordable Care Act was being developed, but the credit (and the blame) has been assigned through the informal name it’s been christened with: Obamacare. At CCMU, we know that no matter the message, the messenger matters. And, we believe it isn’t just the messengers with the most name recognition or the loudest voice that can and should drive change. In 1948, “Jimmy,” a 12-year-old cancer patient, appeared in a radio broadcast, shared his story, and unwittingly launched the war on cancer. The Jimmy Fund has now raised millions of dollars for cancer research, and many continue to fight in his name. And, eighteen years ago, a few passionate physicians made their case for Colorado’s vulnerable patients to a room full of health care leaders, and it launched CCMU into existence. So, we’re looking for an effective messenger to speak up on health equity, health care costs, access to care, and other important issues. Maybe it’s us. Maybe it’s you. Maybe it’s a patient, or many patients. What we know is that the right message, at the right time, from the right person, can make all the difference, so we must continue to speak up and help others speak up, too. One of these times, the world will be convinced.